Welcome to a highly original and very chunky house that manages to stand out due to both its architecture concept approach and impressive panorama at the foot of the Alps. Enchanting surroundings make the House Haller more than just 150 sqm house – it may also be a magnificent vacation residence. 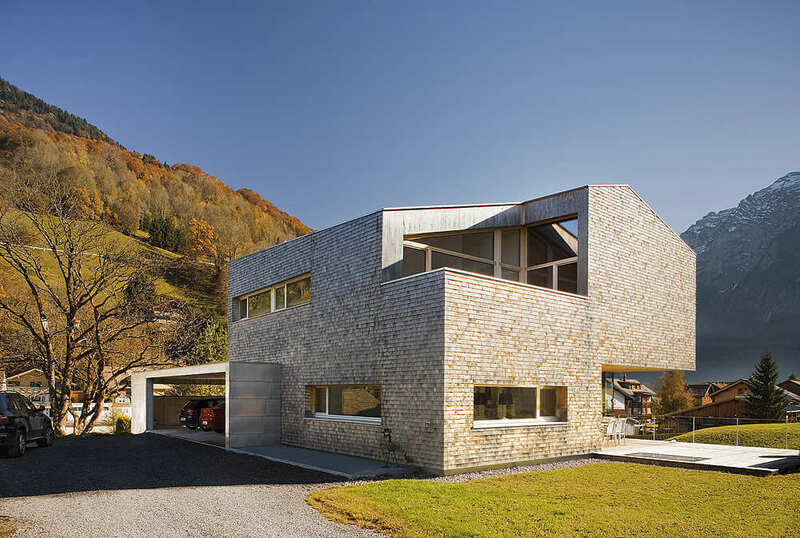 Haller Jürgen in close collaboration with his colleague Peter Plattner designed the house on a sloping site in Mellau, Austria, a small village in the Bregenz Forest, a less populated area. Most architects are seeking similar areas, place and space that allows them to develop as thinking about art itself. Their conception emphasis very much on energy efficiency and environmentally friendly, as well as using sustainable building materials. The main objective of this project was to combine living and working areas under one roof. So the house has two zones, one for work and one where the owner sleeps, eats and spend his free time. It has a descending form from the highest level of the roof, attic and basement is quite large. This welcoming house looks great from every angle and fits in so well with its surroundings as well, being in harmony with the neighborhood. Perfect use of wood, glass and geometry create a unique but livable home. The entire design is characterized by a stunning simplicity. Deep cuts in the building bring the light in from all sides. Bright spaces, wide open, clean colors chromatic, predominantly white defines the modern looking interior. Wood plays a major role in this house, both for construction and its appearance: it consists of elements of timber frame construction, both sides are planked with sheet material. Wood determined not only the views of this house, but also shapes the ambience of the interior: exterior walls and ceiling were white fir dressed, the wooden floor is made ​​of oiled oak. A fireplace serves as a room divider between the dining and living area and provides the transitional period for campfire atmosphere. Glass doors give a view of the wild and romantic landscape panorama.